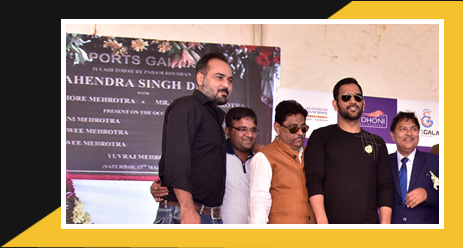 Nations most unique sports boarding school, Seth Anandram Jaipuria School, Alambagh Campus in association with Sports Galaxy by M.S. Dhoni is committed to provide personalized purposeful learning environment where in students are challenged to master a broad range of skills. To provide professional sports training with the help of quality Coaches, World class infrastructure and Sports Facilities catered by Sports Galaxy. Academic guidance and personality grooming catered by Seth Anandram Jaipuria School, Alambagh Campus. Self dependency, self confidence and essentials life skills required to face the challenges of growing up will be inculcated. Rigour and quality performance define our foundational approach to growth both on field and in school ,equally important is our embedded emphasis on character development and social responsibility which we abjudge to be a vital component in our quest to prepare our athletes for the time when they our out their in the open world trying to achive there dreams and goals. In the SPORTSTEL PROGRAM major emphasis will be laid on the providing students with professionals sports training to achive their goals of becoming a professional sports person, for this to happen the daily schedule of the students will be designed in such a manner that students can devote their time to sports in more capacity and also give sufficient time to the academics.Academics will be looked after by Seth Anandram Jaipuria School, Alambagh Campus. The students will have customized school hours so they can devote more time to sports development as well as look after their studies and personality grooming , the sports program students will be enrolled into different sections so that a different curriculum for them can be operated upon smoothly. Students are admited to Seth Anandram Jaipuria School, Alambagh campus, Sports Galaxy and the Hostel. Training schedule will be orgained twice a day. School hours will be sandwiched between two training schedules. Schools hours for Sportstel students will vary from three to four hours. The food served will be as per student requirement based on suggestions of the nutritionist. Number of holidays will be reduced in this program to accommodate the lost school hours. Students will be provided world class hostel facility for comfortable living in campus wherein they will be taken care of and nurtured in a homely environment. Warden staying within hostel premises.